Home>Service Resource>How Much Does a New HVAC System Cost? There is of course a wide range of costs to replacing an HVAC system. The range depends on a number of factors and choices, including system size, type, energy efficiency, time of year purchased, available rebates/incentives, the equipment manufacturer, and labor/installation costs. In this article, we’ll break it all down for you so you will know what to expect and can purchase confidently. When an HVAC technician talks about the “size” of your system, they’re not talking about how many inches tall or wide the unit is – And though size is measured in tons, they’re not talking about how heavy the unit is either. The size of an HVAC unit is measured in how much heat it can remove from your home (thus cooling it) in one hour. Instead of measuring in multiples of 12,000 BTU/hr, which is about how much energy you’d have to use to melt one ton of ice in one day, heating & air people just started referring to equipment in “tons” of capacity. So what size system do you need? There is a correlation with how much space needs to be conditioned by that system (a larger area will usually need a larger unit), but it’s not quite as simple as that. The right size system will be able to adequately heat and cool the space under normal environmental conditions while avoiding “short cycling” — That’s when the equipment cuts on and off in rapid succession. It will annoy you, make your home less comfortable, and ultimately shorten the life of your valuable equipment. If you’re already experiencing some of these problems with your old system, that system is likely oversized. Unless you upgrade to variable speed for your new one, you will want to install a new unit that is smaller (in tons). Fun fact: “Smaller” systems of today can sometimes be physically bigger than older ones of greater tonnage, due to the space required by components that improve efficiency! The proper size system for your home depends on a lot of things, but if there’s any doubt, your technician can complete a load calculation on your home to recommend the most appropriate size. A load calc factors in characteristics such as windows, square footage, local climate, and insulation, among other things. All of this information is computed using an accepted standard for determining the “load” on a structure for heating and cooling and the calculation determines the optimal size for a given structure. This standard is called the Manual J, from the Air Conditioning Contractors of America (ACCA). There are several types of HVAC systems commonly used in the Raleigh/Durham Triangle area (or really we could say across North Carolina and the whole southeastern US). These types include: the split heat pump, the split A/C and furnace, the gas/electric package unit, the heat pump package unit, and the hybrid heat pump A/C package unit. When you’re replacing your existing HVAC system, you don’t have to stick with the exact same kind (which is called a “like for like”). But your installation costs will likely be lower if you do, because there will be fewer changes required to install the new system. If there’s a good reason your home already has a particular type of system, it might make sense to keep using that type – For instance, a “package” unit might have been chosen to save indoor space because it puts all the mechanical equipment outside and connects directly to your air ducts. Or in a home with more space, a split system would be chosen for its greater efficiency. We will help you learn more about each type and its advantages in a future article. Seasonal Energy Efficiency Rating (SEER) – SEER, or the Seasonal Energy Efficiency Ratio, is the most commonly used measurement of efficiency for air conditioners. It measures how efficiently a cooling system will operate over an entire season of standardized temperatures designed to mimic an average US summer. You might sometimes see “EER” mentioned as well — It’s not necessarily a typo. It measures how efficiently a cooling system will operate when the outdoor temperature is at a specific level (95 degrees F). Annual Fuel Utilization Efficiency (AFUE) – For heating systems that burn their fuel, such as furnaces or boilers, the relevant measure will be AFUE, or Annual Fuel Utilization Efficiency. Air-source heat pumps use electricity plus natural temperature differences, so they are measured instead in HSPF, the Heating Seasonal Performance Factor. As with many other products that you purchase, such as cars, computers, TV’s and other consumer goods, prices on HVAC equipment will vary throughout the year. Did you know that heat pumps and furnaces make great holiday gifts? And everyone loves to celebrate Independence Day with a new central air conditioner! 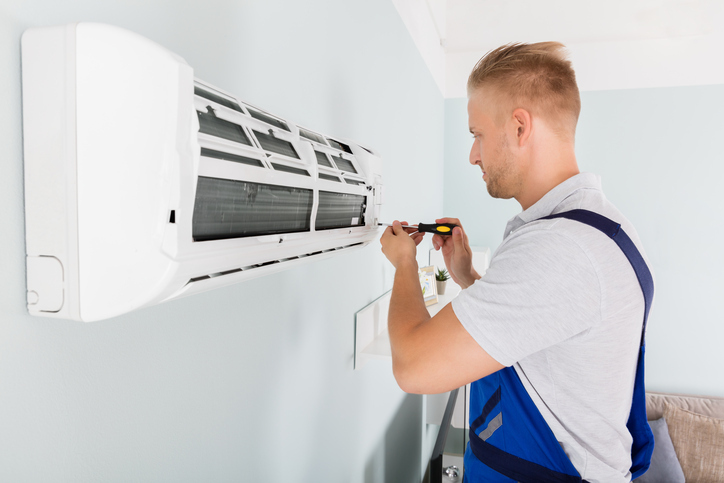 In addition to these great ideas, people have other reasons buy more HVAC equipment in winter and summer — And when they do, they pay more than the ones who proactively replace their systems when the weather is less extreme. Suppliers want to sell things all year ‘round – So they offer their best deals in the spring and fall. We’d love to help you learn more about HVAC equipment rebates & incentives. Learn more by reading our Guide to Rebates, Tax Credits and Manufacturer and Dealer Incentives. Of more than 20 commonly recognized HVAC manufacturing brands, there is actually a relatively small number of parent companies that owns and manufactures all the different kinds of equipment. In addition, these different brands will often use common suppliers that make internal components, such as compressors and electrical parts, and then supply those to multiple manufacturers. It’s sort of how whether you choose a Chevy, a Buick or a Cadillac, you’re getting a car made by General Motors with many of the same parts that go into Toyotas or BMWs. There will be some differences in the quality of the materials and manufacturing, but maybe not as much as the marketing makes out. Among the manufacturers you will find various price points related to quality and features — but also to brand recognition and advertising. One of the biggest variables in the cost of replacing your HVAC system is your installation cost. Some companies are going to do a better job, hire better people, use better materials, and run a more efficient operation than others. This will all translate in some way to what you pay and what you get. In addition, your unique installation requirements matter. Can you (or should you) keep using your existing ductwork? What about the electrical wiring, the drain pan, or the outdoor equipment pad? Each estimator is going to evaluate what needs to be done and what time and materials will go into the job plus a standard profit factor. You shouldn’t necessarily choose the cheapest or most expensive until you understand what each installer is doing (or not doing) and you feel comfortable with the answers and are confident in the result. So the moment you’ve been waiting for… the answer to all your Internet searching: How much should MY installation cost? You know that a precise answer isn’t possible, but the table below will give you some idea what you might expect to spend on your HVAC replacement project.